Posted on December 4, 2018 by Ching under Food and Drink. Brian and I finally got around to trying Slim Chickens. The restaurant has been open for some time but, now that we no longer live that way, we really hadn’t ventured out to those parts in a while. That entire Northeast area has completely flourished the last couple of years. When we were driving to the restaurant, I told Brian how I can still remember the days (almost 10 years ago) when there was absolutely nothing out there. 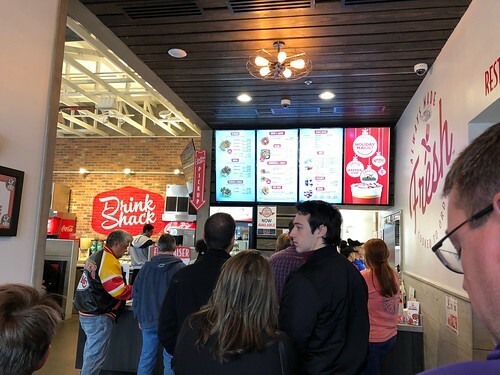 For a long time, the only restaurant chain out there was Chili’s and they actually had to close because business was slow — because there was absolutely nothing around them to help bring traffic. The Chili’s is open again — at the same location — along with a plethora of other businesses. 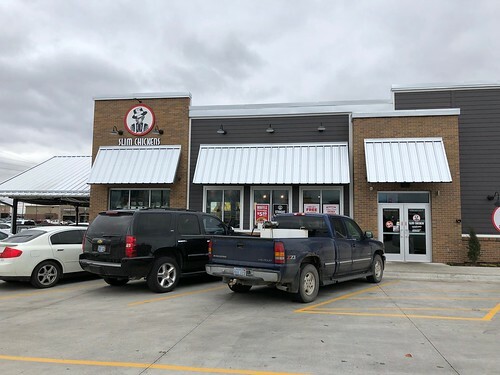 There has been quite a boom the last few years that’s brought about all sorts of businesses, including Slim Chickens. We tried it for the first time on Saturday. You would think the interest would have died down by now. Slim Chickens has been open almost two years. 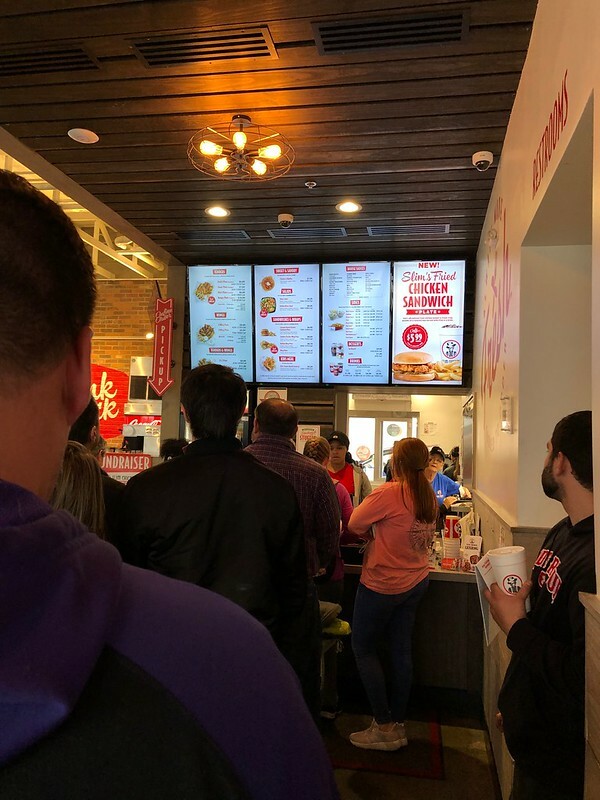 However, when we were there on Saturday (despite it being already after the lunch rush), we were still greeted by a line that was almost to the door. I took a couple of pics while we were waiting in line. You basically order at the counter and then they give you a number to bring to your table and then someone brings the food to your table when it’s ready. Well, except for the dessert which is pre-made. You get that right away. It was kind of disappointing because we really had our hearts set on the desserts that were pictured on the wall — one was some kind of chocolate mouse dessert in a mason jar and the other was strawberry shortcake in mason jar. They didn’t have those so we had to settle for what was available. 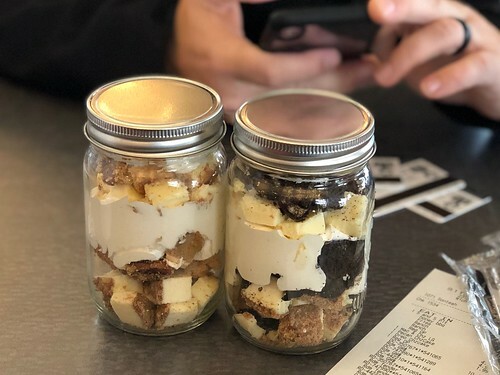 I got pecan pie and cheesecake bites in a mason jar and Brian got the Oreo cookies and cheesecake one. They also had a pumpkin pie one, which neither of us were really interested in. 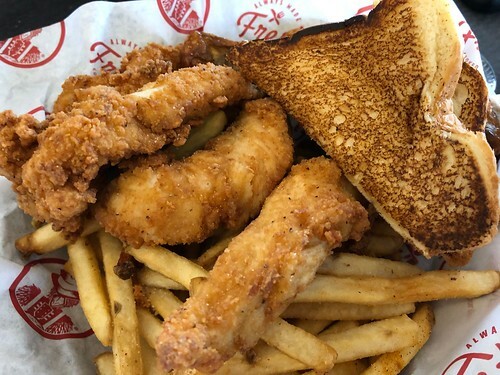 Brian and I shared a meal consisting of five chicken tenders, five chicken wings, fries, and toast. 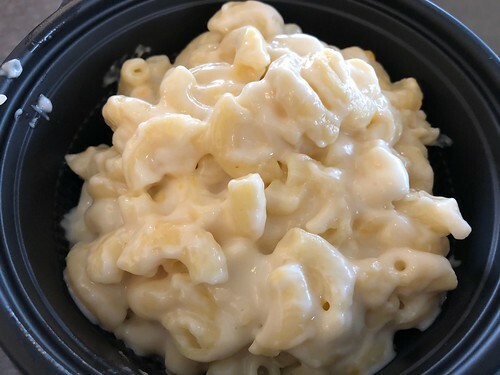 We also shared a bowl of mac and cheese. It doesn’t look particularly appealing but it wasn’t bad otherwise. As fast food goes, Slim Chickens is not particularly fast. We had to wait quite a while for the food to be brought out. We actually started eating our desserts. The food wasn’t bad. If you like chicken and don’t mind the wait, it would be a good place to check out. 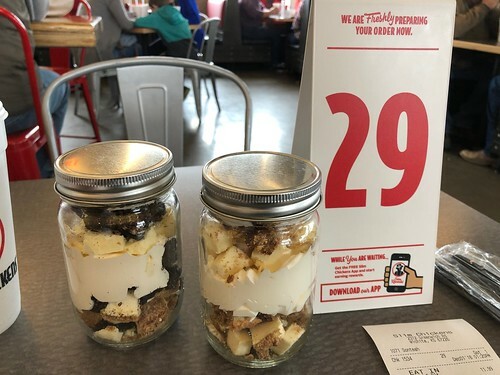 I thought the mason jar desserts were kind of cute. We kept ours because we couldn’t finish our desserts. Actually, the rest of mine still in the fridge. Now that I’m thinking of it, I might bring it to work for lunch tomorrow. LOL. It should still be good, right?